Hoo Loves You More Than Me??? 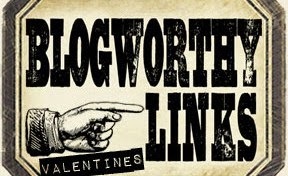 You may have noticed a little difference on my blog today?? I changed the background color. I suddenly felt like the dark blue was depressing!?!? Maybe it's because of the winter darkness - so I changed it to the lighter green - not sure this is what I want, but I'll stick with it for a while to see if it grows on me!?!?! 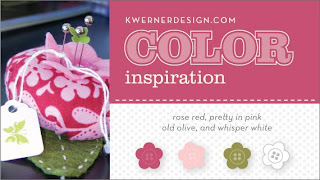 Here is my card for today's color challenge on Split Coast - to use So Saffron, Bravo Burgundy & Handsome Hunter. This is a 4 1/4 x 4 1/4 card that I cuttled with the Argyle folder. The hearts are nestabilities. I paper pieced the owl with some Stampin Up Argyle designer paper and added google eyes. 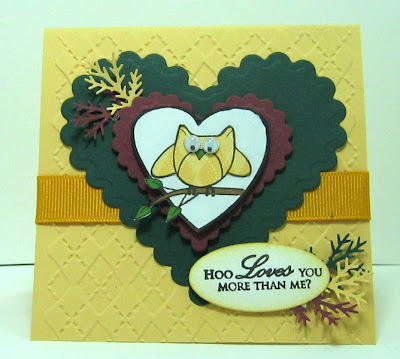 This cute little owl sitting on his leafy branch is from the My Favorite Valentine set by H&M Stamps. The ferns on the sentiment and heart are a Martha Stewart punch. The heart and sentiment are popped up on foam dimensionals. Well - I have to run - it took me a couple of hours to get this card together and DH is starting to look for supper!! Thanks so much for stopping by! Hope to see you again tomorrow! The Mackenzie Childs Catalogue was our inspiration today over on Split Coast - boy would I like to buy a ton of stuff from there but it would definately break the bank!! (check out the prices of things!) 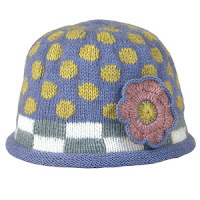 I was ultimately inspired by this fun knitted hat: And here is the card I created. You'll notice it's another Thank You card! I stamped the dots on the Ballet Blue card stock with Brilliance Pearlescent yellow ink using the dots stamp from Polka Dot Basics by PapertreyInk. I layered my flowers and connected them with a brad. The sentiment is a rub on by Deja Views. All of these items I have had in my stamping room for quite some time - especially the ribbon that I've had for over a year and I think this is the first time I've pulled it out. My new years resolution (starting with this card!) is to try and use all the 'stuff' I already have in my stamping room before buying new 'stuff'! I don't know how long this resolution will last - as all the Stamp companies keep coming up with such CUTE stamps that I just NEED to have - and I don't know how strong I am - but I'm really going to try!! How many of you are with me???!! It's kind of a relief to stop making Christmas cards isn't it!?! 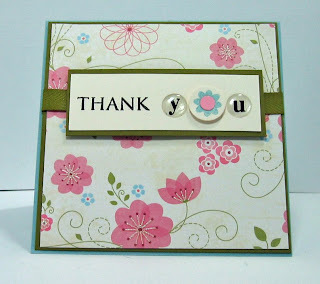 And we will certainly need several of this kind of card after all of the gift giving and receiving! My card also covers the Double Dare Challenge I do with some SCS friends. 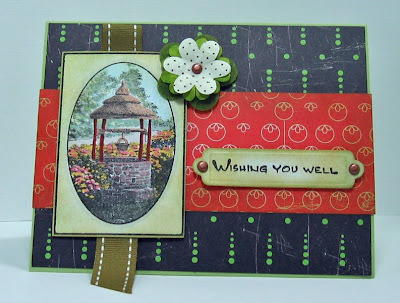 Joan Ervin's challenge this week was to make a card full of flowers - to get that feeling of spring going (even though winter has really only just begun!) 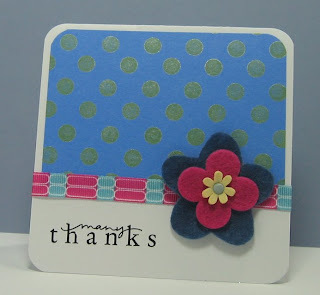 I stamped the THANK from the Papertray set by PTI then used epoxy letters for the y and u - and I stamped the flower from the same PTI set for the o. The sparkly flower designer paper is by Imaginisce. You can see the other spring challenge cards here. I'm off from work until Monday and my plan is to get some sleeping, stamping, cleaning and exercising done (at least a LITTLE of each !?!) notice eating is conspicuously absent from this list?!?!? 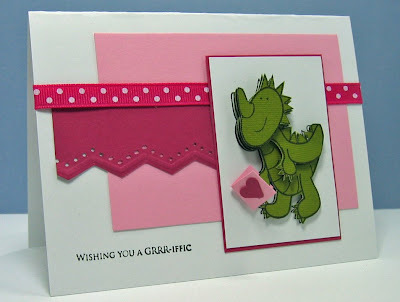 First, I'll show you my card for the Split Coast color challenge. 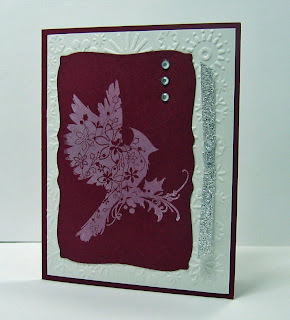 I used Cameo Coral and So saffron but substituted Plum Pudding by Papertrey Ink for the Orchid that was listed. I had to struggle a bit with these colors as they are not ones I'd usually reach for! I used a fun cheer leader stamp from the H&M Stamp set called a Girls Obsession that I framed with 3 pieces cut with my Spellbinders Label One. I punched the stars out of So Saffron card stock and put a little bit of gold stickles on them for some shimmer. I bought my dear husband tickets to a Boston Celtics Basketball game for Christmas and wanted to make a card to give them to him in. 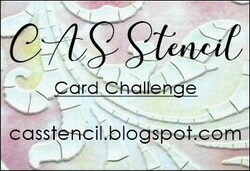 So today's sketch challenge on Split Coast gave me the design for my card! There is no stamping on this - just stickers and cuttlebuging. 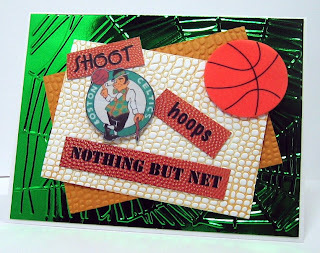 I used the Spiderweb folder on the metallic green back ground panel to loosely represent the lines in the basketball - and the mesh folder on the two panels for the texture of the ball. I found the Celtic logo on line and printed it on card stock. The basketball is a foam sticky. And here is the most delightful card I just received from my SCS buddy - Cindy (Mothermark) She is truly a paper artist - very often not using stamps on her cards at all! And one final picture of our Christmas tree this year - it's an artificial one but I think it looks very real - it's new this year. After ALWAYS having a real tree and HATING fake trees - the cost of the real ones and the fact that they usually don't even have the wonderful pine smell anymore since they are cut so long before we purchase them - I finally succumed and bought this - and I LOVE it! 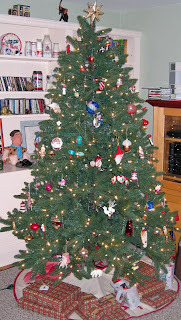 and if I light my Yankee pine candle - you'd swear it was real - I keep telling DH - don't forget to water the tree!!! LOL~!!! 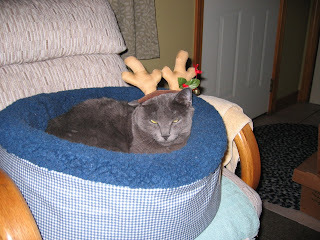 And you can see how much Boo loves her holiday Antlers!!! Have a blessed Christmas and Happy Chanukah everyone!! 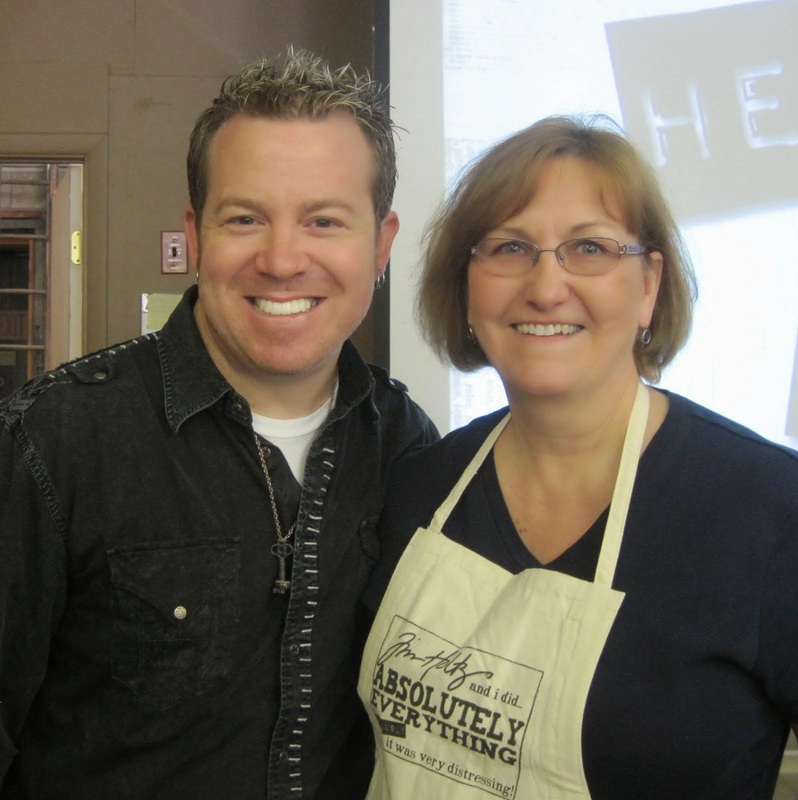 This week I was the hostess for the Double Dare Challenge I do with some SCS friends. I sent everyone this Thomas Kinkade image to use on a card. 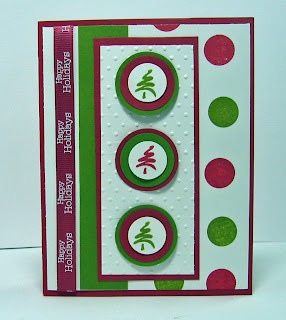 I used some new Cosmo Cricket designer papers that are kind of funky - not the usual colors that I pick for cards. I'm not sure these dark colors would actually make anyone feel better!?! LOL! I used Copics and Prismacolor markers to color the image. You can see the other Kinkade cards here. My next project is three binders that each hold 4 cards. A friend at work asked me to make some cards for him to give to his mother as a Christmas present - some THANK YOU, some SYMPATHY and some BIRTHDAY. She is elderly and can't always get out and so she likes to have cards on hand for when she needs them. This is how the inside looks. Each side holds 2 cards and 2 envelopes. And finally I just have to share these wonderful Christmas cards I have received from some of my blogging/Split Coast Stamper friends. This cute snowman one is from Joan Ervin. Thanks so much for stopping by - Christmas is coming!! 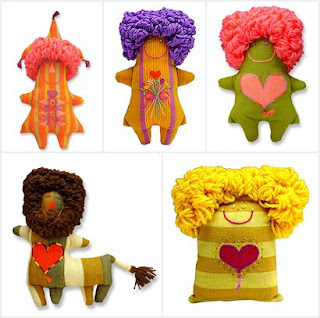 This was one of the fun images Stef showed us on Split Coast for the Inspiration Challenge - a web site of Alexander Girard, a textile designer. 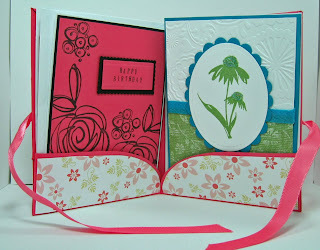 I was inspired by these images because I knew my Doodlebug Factory stamps were PERFECT for this! Here are Zot, Frozey and Twinkx greeting you and all ready to party! Don't know if you can see it but I used yellow flock on Frozey's head to try and give the look of the yarn on the inspiration piece. 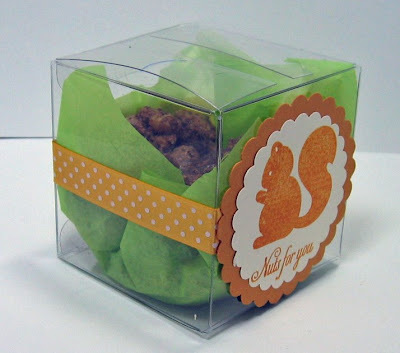 And here is another quick packaging idea for a holiday food gift. I get these great little boxes from Clearbags.com. The stamps are from the My Punny Valentine set by Papertrey Ink. The ribbon is from PTI also. 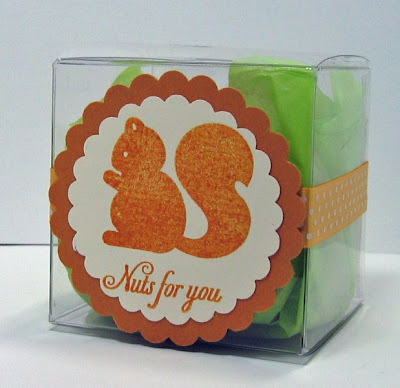 I used Naturals Ivory and More Mustard card stock from Stampin Up. Inside I just tucked a square of green tissue paper. And you can see the Sugar & Spiced nuts (Recipe by Denise) tucked inside. This will be included in a bag of treats I'm giving some friends. Here is my last minute easy project for this weeks technique challenge on Split Coast. This really was a quick project (of course you have to already have the little wooden sled!) I found a bag of 6 little sleds in my craft room - something I had picked up at a yard sale and promptly forgot I had! I painted it with red Acrylic paint. While it was drying - I stamped and cut out the moose from H&M Stamp set Nature's Style as well as the sentiment. 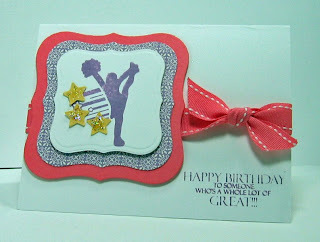 I punched the ferns (Martha Stewart) and made the bow (Stampin Up) and attached everything with glue dots. I tied the rope twine through the holes and added dew drops. A quick ornament as a small gift or as a tie on for a larger gift! My second project for this challenge is a box for a mini loaf of bread (5 1/2 x 3 x 2)You can see the tutorial for this on Mary Jo's blog: All you need is one piece of card stock and some designer paper. They are super easy to put together and make a little loaf of banana bread look like a super classy gift! 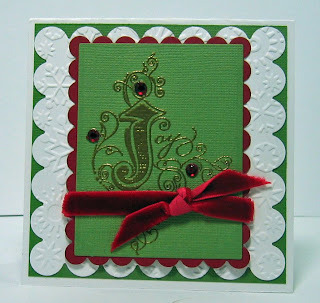 And I have one more project to show you tonight - Sharon's Stamp Simply challenge this week was to make a Christmas card that is so simple that someone could make 6 of them in less than 20 minutes. Well - mine are Cookie Cards - and, of course the cookies would take longer than 20 minutes - but these 10 fun CD holders - that I put the cookies in - only took me about 20 minutes to put together. 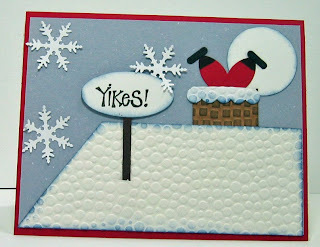 I used a stamp from the Just Rite Christmas Stamp Ensemble and Pure Poppy ink. I punched out the sentiment image then punched a larger Pure Poppy circle - layered them - attached the ribbon and that's it! I'll be giving these to some co-workers. It's the kind of gift you give to people that you don't really exhange gifts with - but want to give them a little something. 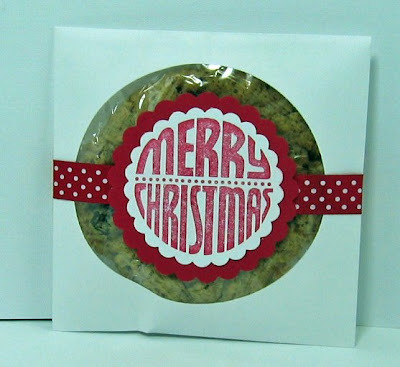 And packaging a big cookie like this makes it seem like a nicer gift than 'just handing them a cookie'! And here is a parting shot of my house - where we are presently having our first major snow storm of the season. 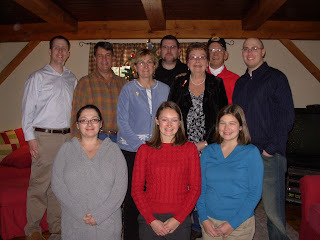 Can you see the snow blurring by the window on the right? 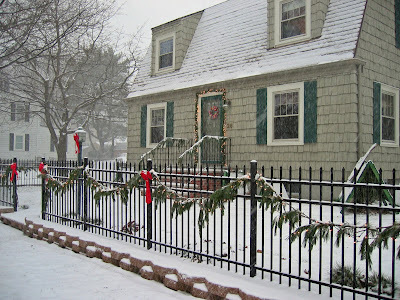 There are lights on the swag on the fence and around the front door - and they look so pretty with the darkening night and the snowfall! It's predicted we'll have a foot of snow by morning. 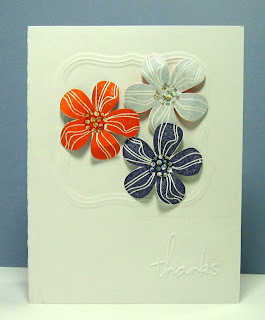 I hope I've inspired you with my little crafts - thanks so much for stopping by today! A couple of posts ago I showed you the cute Dreidels I made as part of Chanukah gifts I was making for the doctors I work for. I finally finished all the treats and thought I'd share them with you. I got these pretty baskets at Christmas Tree Shop for $1.99 and they worked just perfectly to present all my treats! These are the dreidels again - I found the pattern on Marthastewart.com under crafts/dreidel. I filled them with a bag of sugar spiced nuts that I made using the wonderful recipe that Denise (peanutbee on SCS) published on her blog. I printed labels on my computer to label each item. Next up - I made these delicious Oatmeal raizin cookies from a recipe I found last year in Martha Stewart's magazine. 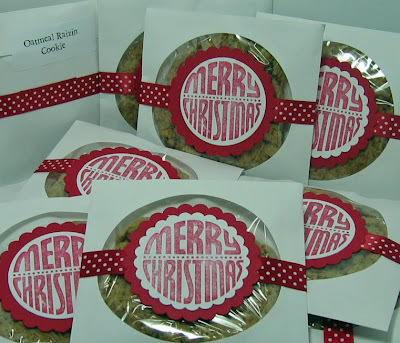 The article also showed how to use window CD envelopes to make each cookie a little present in itself! 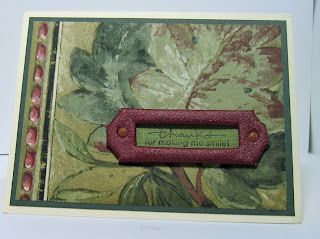 I decorated mine using the Mazel Tov stamp set from Papertrey Ink. 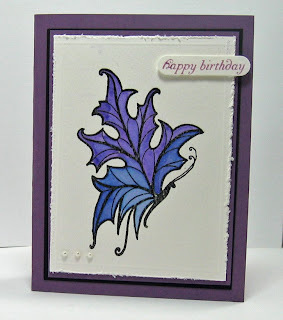 I embossed the image with silver embossing powder and then colored the candles with Copics. The framing scalloped circles were punched using Marvy punches. I just love this little cake box container that I found while blog hopping - it's made from one 8.5" x 11" sheet of card stock. 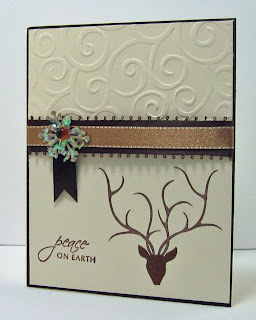 You can see the tutorial for this on Mary Jo's blog here. I used Ballet Blue card stock. 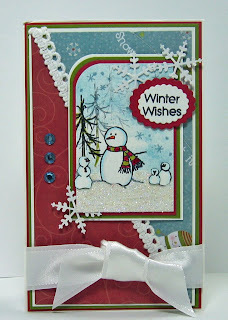 The designer paper is Snowy Day from Stampin Up. I punched the lacey edges with a Martha Stewart punch. Inside is a yummy loaf of banana bread that I made using whole wheat flour instead of white. They came out a little more dense and have a subtle nutty flavor. I just attached a ribbon around the bread and a printed label saying what it was. Since Chanukah starts this Sunday - I gave the baskets to the doctors today - and they both absolutely loved them and appreciated that I had made all the treats and the packaging as well. One of them said he didn't even want to eat the treats because it would ruin the beautiful presentation - a most satisfactory response for a crafter don't you think??!?!? It's so nice when our efforts are appreciated! And I appreciate that you stop by here to check out what I'm up to! I'll be by to visit you too! Oh!! 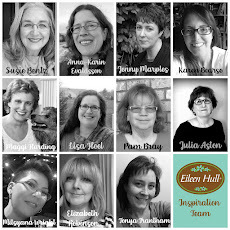 and check this out - Spellbinders is looking for new Design Team Members they have some super perks if you make the cut! (is that a pun?!) 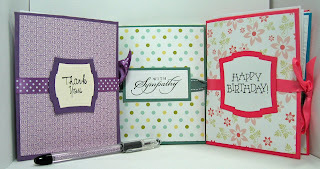 I just love all the nestabilities and spell binder dies don't you!? I used the Labels one die on the rum cake packaging just above. I want to be as peaceful feeling as this card is peaceful looking! 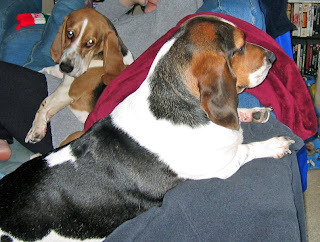 But I have too much to do tonight - I need to be working on some Christmas gifts - so what do I do? the color challenge at Split Coast of course! I got this idea of the layered trees in my head and just had to make the card before anything else! (you know that feeling - right??!!) We were to use Not Quite Navy, Kiwi Kiss, Baja Breeze and Basic Grey. I had to use Night of Navy card stock for one framing layer but I did have Not Quite Navy ink so used that on the sentiment. And the trees are Kiwi Kiss and Baja Breeze. I fit the Basic grey in for the bottom layer. I love how the Swiss Dots look like it's snowing in the forest when you cuttle the whole panel. Now I can take a few deep breaths - relax a little - eat some supper and move onto my other projects hopefully in a calm peaceful manner!!! Hope you have a quiet relaxing night too! The Double Dare Challenge that I do with some SCS friends was from Anne (jdmommy) this week and her challenge was to make a New Year's card with some shine or bling. 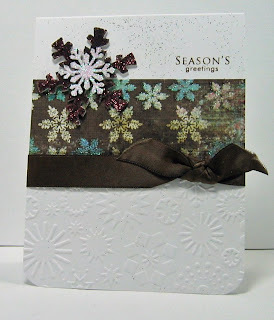 I've been waiting to use this Happy New Year's hat stamp by Stampendous all year! 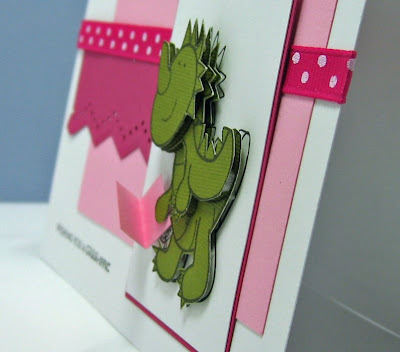 So I whipped that right out - and I actually cased one of my own cards - (you can see it in my post below) because I just loved how the embossed city scape stamp by Amuse looks and thought it would work for this card too! 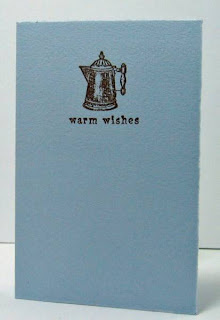 I used a dotted blue designer paper for the sky and embossed stars from the Take a Bough set from Papertrey Ink. You can see the other Double Dare New Years cards here. I made these Dreidels as part of a gift I'm giving my bosses for Chanukah - I'll be putting some candies or nuts in these and I'll include some home made cookies and little breads wrapped up in a box or a plate of some sort (haven't gotten that all planned out yet!) I'll show you that when I get it all made up! I found the pattern on Martha Stewart.com under crafts - I searched on dreidel - I enlarged it about 200 times to make it a finished size of about 4 1/2 x 2. I punched a 1/4 inch hole in the top piece and inserted a 1/4 inch dowel and tied a silver ribbon (Papertrey Ink) around it. I put some glue around the opening inside and out that will hopefully hold the dowel in place!?! The piece on the left shows you how it looks before I taped it all together so you can see the images I silver embossed on the sides. 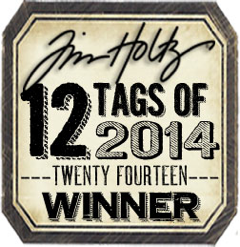 The stamp set is Mazel Tov by Papertrey Ink.